Hard to believe how many buildings in Indianapolis have been razed under the guise of “progress” or “enhancing” a neighborhood or block. All the harder to understand when a building fronts major thoroughfares with a constant stream of visitors. Such is the case for a long lost six-story building that held down the southeast corner of Capitol Avenue and West 16th Street, directly across from the massive Methodist Hospital complex, from 1926-1978. Looking across the acres of weed strewn vacant parking lots along 16th Street from Illinois to Capitol, it’s hard to imagine or remember that this was once a bustling area filled with commercial activity and industries–like the Bookwalter Printing and Binding Company, Weigand’s and other flower shops, and a multitude of apartment houses. 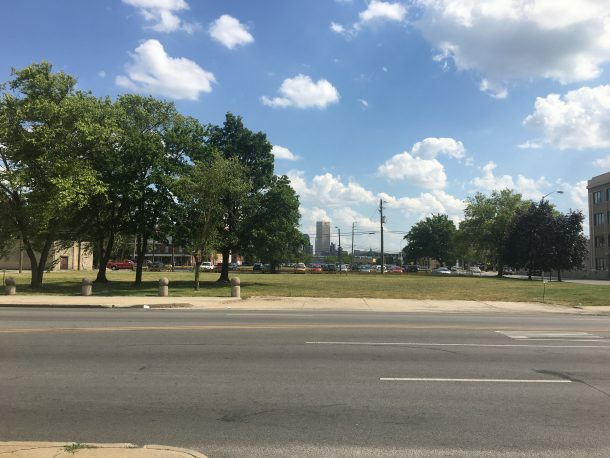 16th Street has long been a key east-west thoroughfare, connecting Indianapolis and Speedway, at least. 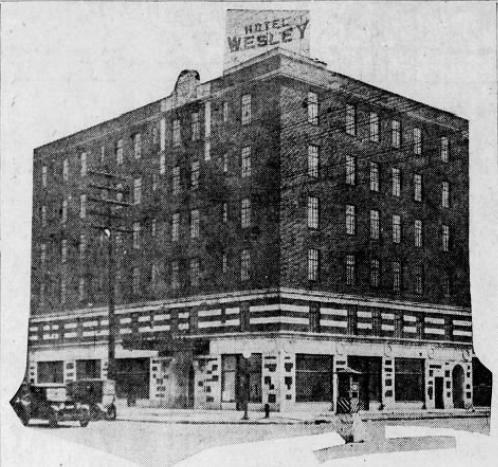 In July 1925, a capital fund campaign launched to build the Wesley Hotel. The Ostrom Realty Company constructed the hotel, which debuted in April 1926, and named for John Wesley, founder of the Methodist Church. 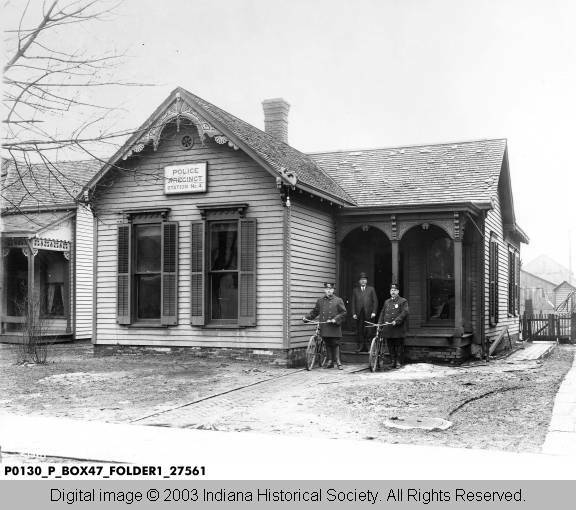 Big city hospital didn’t exist in small-towns of rural Indiana, necessitating travel. The creation of the 100-room hotel targeted patients and visitors of patients, and other travelers–like those attending the annual 500 mile race. 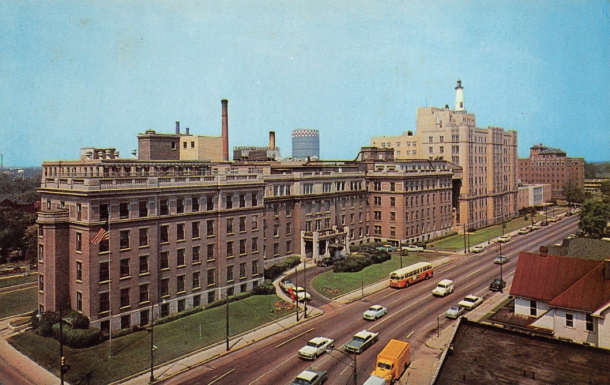 The year before the hotel debuted, more than 8,000 surgical cases were handled at Methodist Hospital. More than 50% of those patients lived outside Indianapolis. A handy adjacent hotel made perfect sense for this Indianapolis hospital hub. Built of brick and stone for $350,000 by the Hotel Wesley Building Company, organized by George B. Rubens, president and Norman A. Perry, vice-president, the local businessmen insisted that Indiana products should be used as much as possible in the building’s construction. Always trendsetting, long before #shoplocal, Indianapolis businesses collaborated to mutual benefit. 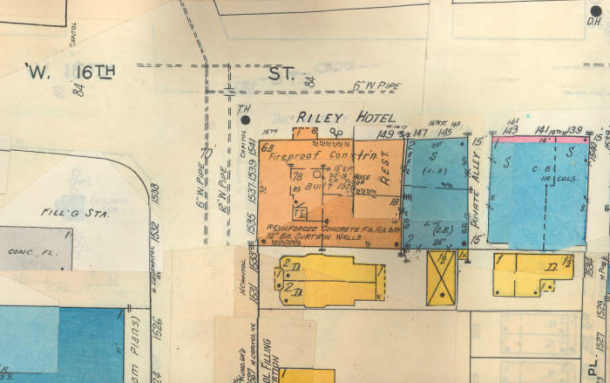 Situated along a principal intersection, and connected to downtown by street car lines, Hotel Wesley opened mere months before the debut of an even larger and more impressive hotel of similar composition– still standing today: The Marott Hotel at Meridian and Fall Creek. The two buildings also rented both apartments and hotel rooms. 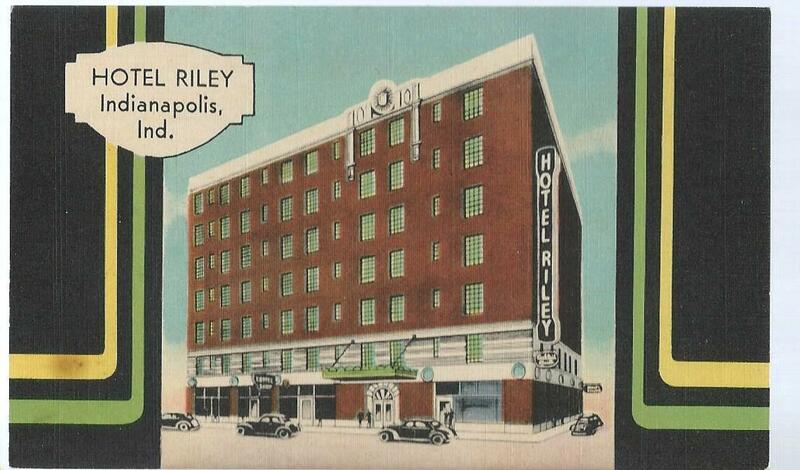 However, this hotel marketed its location as a straight shot to the Indianapolis Motor Speedway– and fans and drivers did make this hotel their home away from home during the races. 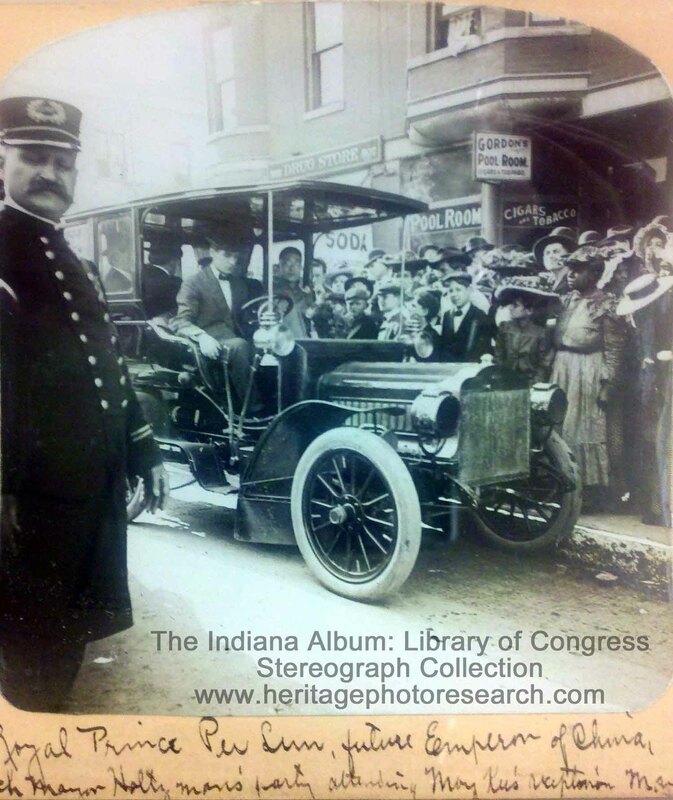 The 1928 winner of the Indy 500, Billy Arnold, had his Chrysler model of the same year stolen from The Hotel Wesley’s parking lot of the hotel the night before the race. In May 1931, Indy 500 winner Louis Schneider, wife and son were all living at the hotel. The front entrance of the hotel on 16th Street welcomed patrons into a classical Italian lobby, with roughly plastered walls, frescoed beams and graceful archways. The basement featured a recreation room outfitted with wicker furniture, splashes of red and Chinese art. In another part of the basement, as with many hotels of the time, visitors could freshen up in the barber shop. The hotel had only existed for a year before company president, George B. Rubens died, in February 1927. Two and a half years later, Black Friday submerged the country into the Great Depression, which may have contributed to the eventual sale of Hotel Wesley to the Riley Hotel Corporation for $295,000, under new management by the summer of 1932. Another contributing factor may have been the death of Norman A. Perry’s brother in a plane crash in 1929. Norman took over the Indianapolis Indians, previously owned by his brother and built Perry Stadium in his brother’s honor, just a couple of miles west of the hotel. Perhaps a changed focus prompted him to relinquish ties with the hotel? We don’t know for sure what prompted the change of ownership. Comparing images of Hotel Wesley and Hotel Riley, it looks like an additional floor was added at some point. 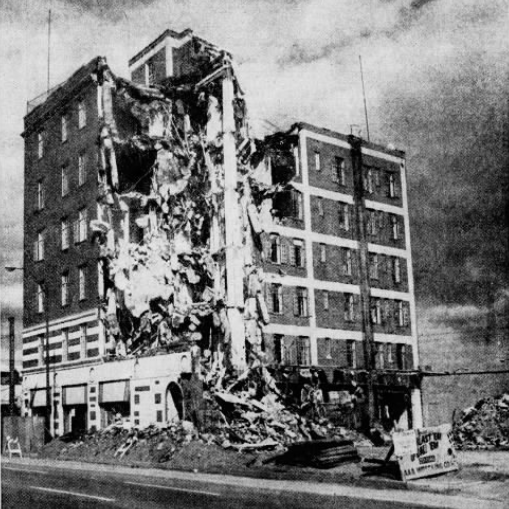 Whether six floors or seven, the hotel was one of the tallest structures in the area. Since the place advertised 150 “fireproof” rooms, a restaurant, coffee shop and a cocktail lounge in its second life, the addition of a floor makes sense. Certainly, there was some reconfiguration. 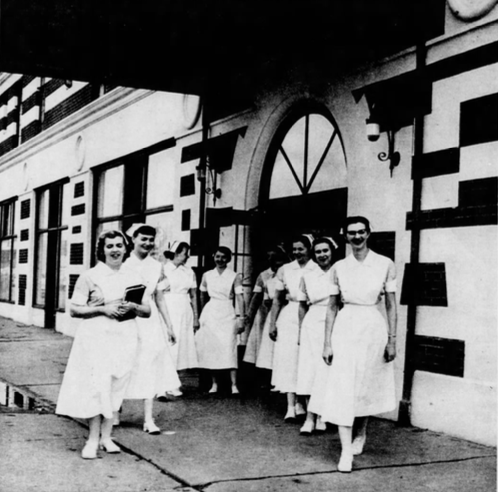 In August 1954, the remaining contents of the hotel were auctioned off as it prepared for new life as a residential facility for Methodist Hospital nurses. The name returned to its initial Methodist affiliation: Wesley Hall. 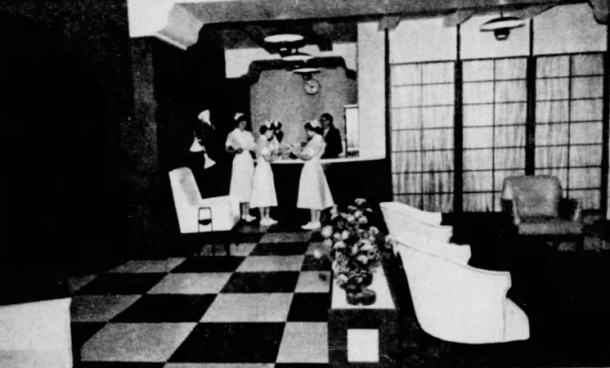 All the nurses rooms were singles with baths between, varying in size, with quarters personalized by the nurses through their own choice of curtains and other soft furnishings. The 1958 class was the first to spend a full year in the new residential digs. Unfortunately, the school met its demise in 1969– a harbinger of the building’s eventual fate. 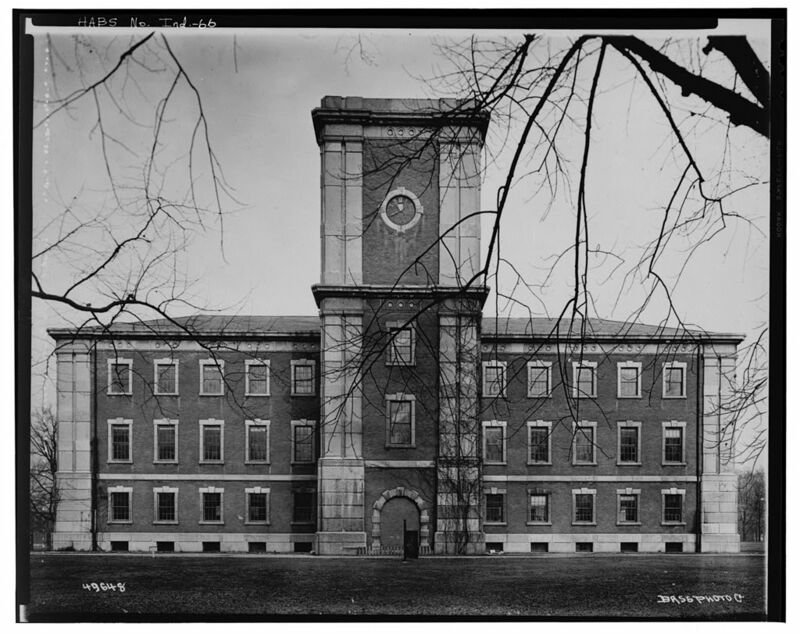 The property remained an annex for the hospital for about ten more years, housing a family practice center until 1977. In May 1978, Methodist’s need for parking space overtook the need for office space The hospital announced that a $25,000 landscaped parking lot would replace the historic building in an effort to “re-enhance” the area. 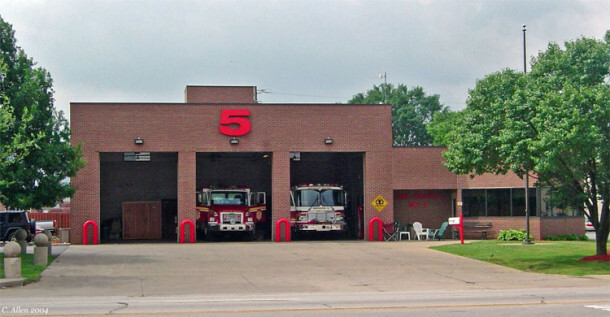 In 1983, the Indianapolis Fire Department constructed Station Number 5 on the site. That station location lasted approximately twenty years before moving further north in 2008. Today the site is a grass-covered lot awaiting a productive use. The curb cuts frequently used by the fire trucks and the bollards on the eastern portion of the 16th street frontage are all that remains of any of its former lives. What memories do you have of this area? Do you know any Methodist Hospital nurses who may have lived here? We’d love to hear from you. Oh, how sad. I know that even our small town once had a downtown hotel. Now the space is either occupied by a parking lot (BORING) or a chain pharmacy (equally BORING). I hate to see real character disappear! My mother recently passed away. Going through items I found a book of matches from the Riley Hotel. Inside my dad had written “Sunday morning,Aug. 23 1942 Mr. and Mrs. Warren Goad” They were married the previous day Aug, 22, 1942. It made me happy to see the picture where they were at their most joyful moment.